Kayaking is a very popular pastime that can be enjoyed in multiple forms, from a leisurely paddle to the exhilaration of white-water rapids. Similar to a canoe in the shape and look, the kayak’s difference lies in the way the paddler can sit in the boat and how many blades the paddle has. A kayak has the paddler seated facing the forward direction of the boat, their legs stretched out in front. The paddles have two blades which are paddled from front to back, alternating regularly from one side to the other, unless of course the kayaker is making a turn or backing up. Most kayaks will also have a closed top, holding the paddler’s torso into the kayak. In recent times though, this is not always the case as more and more people are using inflatable sit-on-top kayaks as a cheaper alternative. The kayak has been around for a long time. In fact, it was created by the Inuit people thousands of years ago who used materials such as driftwood, whale skeletons and animal skin. At this time, the purpose of the kayak was as a hunter’s boat. The kayak allowed a stealthy approach, perfect for hunting and fishing, allowing successful capture of prey. By the 1800s, the Europeans had become interested in the design, with the German and French starting to use it for sporting activities. In 1931, Adolf Anderie paddled one through the Salzachofen Gorge and thus white-water kayaking was born. The sport of kayak races was introduced to the Olympics a few years later, with the design and materials used soon changed to more modern-day materials. It was during this era that the more commonly used fiberglass kayaks were created. 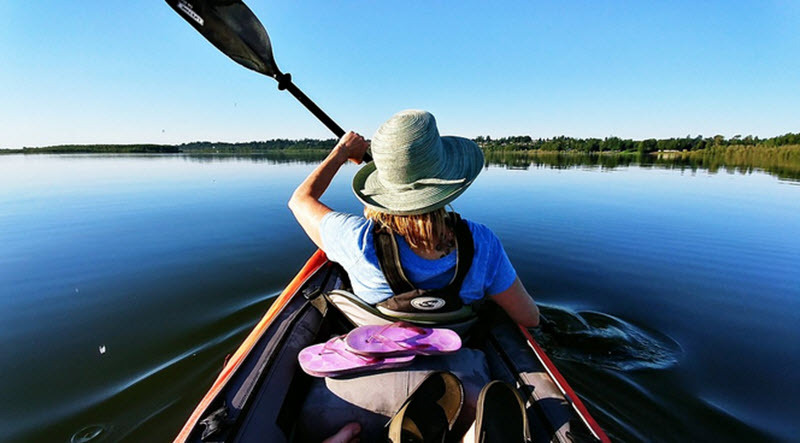 Over the next few decades, kayaking grew from just a fringe sport to a mainstream one, and kayaking now features prominently in many of the large world sporting events. There are a number of different uses for kayaking in the modern day. Each activity will have variations on the way that the kayak is designed. For example, many people will use kayaks for diving, carrying their equipment to the dive site whilst ensuring they are in a secluded and safe area. This also allows paddlers to experience sea kayaking, a form of more strenuous paddling involving the waves and currents of the sea. Others will still use them for traditional purposes such as fishing. It offers an environmentally friendly mode of transport that also allows fishermen to get closer to their prey than a motor-powered boat would allow. Ecotourism is another popular use for kayaks. Again, following the clean environmentally friendly aspect, kayaking allows visitors to experience the ecosystem of an area whilst simultaneously causing the least disturbance possible. Often these trips will enable visitors to see dolphins, manatees, whales and other rare marine life in a closer proximity than would otherwise be possible. With so many uses, it is easy to see why the kayak has become so popular in modern times. The simple design and ease of propulsion by the paddler makes this a fun pastime for anyone.